I was introduced to Andes Mints at a very young age. Though, my strongest memory was not of eating them, it was of being attacked by them. My family commonly went to a little Mexican restaurant in town, and when we finished eating we would get these mints with the check. My two older brothers would make a sort of blow dart from the wrapper, and choose their target. Me. 5. Chocolate Mint Filling: Melt chocolate chips and heavy cream together in the microwave or on the stovetop over medium heat. Stir in peppermint extract and powdered sugar. 6. When cupcake come out of the oven, use a squeeze bottle to fill the cupcake with the filling, or use the filling as a ganache and dip the tops of the cakes into it. Oh my goodess! I want 1, or 2, of these right now! I love mint chocolates. My parents were never sweets people, and mint chocolate was the only chocolate they will ever eat. I love how restaurant give mint chocolate with the check,so I can have it after the meal. I also love the green color. It is just like my town Portland, Oregon. 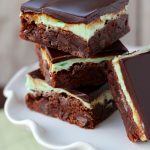 I love almost anything with mint and chocolate combined; these look delightfully delicious. I love, love, LOVE Andes mints! Especially the ones they give you at Olive Garden restaurants, which really hit the spot after a meal of salad, breadsticks, and pasta. I can only imagine how great these cupcakes are. wowzers! i'm totally going to try make these. I just stumbled onto your website and I have to tell you, I have never been so excited about making cupcakes. 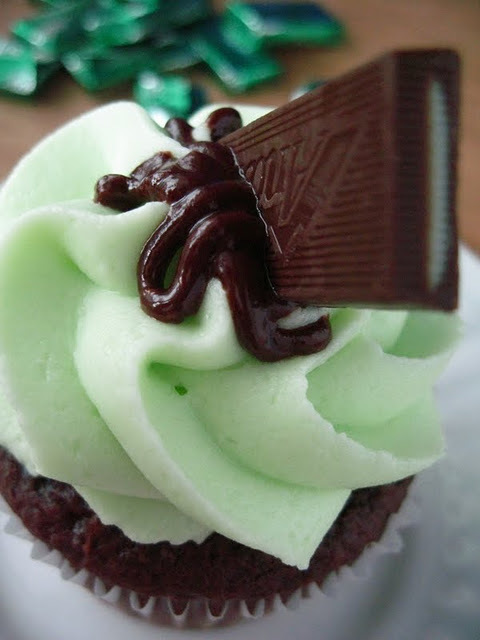 I saw these Andes Mints Cupcakes on another site and just about lost it. I love Andes mints and these look like absolute heaven. I just need to recover from knee surgery so I can make them!! Thank you SO much for sharing. Very nice photos!!! I want to taste this cupcakes! Hi! I just wanted to thank you for the recipe and show you my results 🙂 My icing wasnt very thick for some reason, so it doesn't have the height yours does, but it still tastes delicious! i want to eat one so bad!!!!! I made these last week and they are SO GOOD! I gave a few to the neighbors and everyone was asking for the recipe. Thank you for this one! It's going directly into my arsenal. I made these today and they turned out great with the exception of the butter cream. It wasn't as light and fluffy. Do you have any tips on how to correct this? V, make sure you let the cream cheese and butter beat for a few minutes. Also, make sure you butter is softened (leave it out for a few hours or over night) but make sure it is NEVER melted. Then I usually just add a little bit of powdered sugar at a time until I reach my desired consistency. Good luck! Made these last night, and they were fabulous! Thanks for a great recipe! Found you on Pinterest – following you now! I have NEVER made cupcakes like this before. Sure I've used a box mix but never made my own icing and all too…THESE WERE AMAZING! not too sweet and just de-lish! THANKS for the blog instructions. They helped A LOT! I used 3 cu/confectioners sugar (vs the 3-4 recommended) as I didnt want them to be too sweet and it wasn't. Im not an icing person, but this was spot on! This may be a crazy question, but are the chocolate chips milk chocolate or semi-sweet? They look so good! I'm planning on making them tomorrow night for a small get together! Mandy, I used semi-sweet chocolate chips. Good luck! ITs ridiculous how much i want these! The frosting for these is just awesome. Thank you for a fantastic idea and recipe. My chocolate-mint-loving hubby got these for his birthday too! I store them on the counter in a tupperware! How many cupcakes did this recipe make? The recipe makes about 20 cupcakes. If your Buttercream isn't holding its shape, add more powdered sugar. Good luck! Hello Lizzy, as Marie said above, Olive Garden gave these out when I used to go as a kid. I'm unsure if they do now, but I agree, these were my favorite part of the meal! 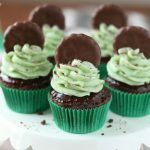 I might make these cupcakes to stir up some nostalgia, they look delicious! Made these tonight after obsessing over wanting to make them for weeks. AMAZING. Made them tonight…YUM!! Thanks for the awesome recipe! These cupcakes look so good ! I am going to make them this week-end ! What a perfect holiday cupcake ! Thanks for sharing ! Can't wait to make these for a party I'm going to. Are those regular size or mini cupcake's? They are regular sized. Good luck! Loved the taste just could not get the icing to be stiff enough to pipe without it being to soft and falling even adding powdered sugar didn't help. Anyone have suggestion on the an alternative to the icing to use in stead of the buttercream that you can still pipe on? HELP!! WOW!!!! 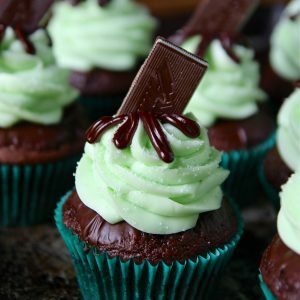 I just make this cupcakes last night, finish the frosting and ganache this morning…to DIE for!!! I made them with the Betty Crocker Triple Chocolate Fudge (I didn't have the Devil's food) they came out really heavy, took 12 to my dentist office and 10 to my son's school to share with the teachers, I keep one for me and one for my son, the size was just fine but they texture, their weight, the flavor…AMAZING!!! I couldn't find the piping tip so I use the 2D from Wilton…never hear about the Ateco, Michael's store carry this type of tips? where can I get those? THANKS FOR SHARING!!!!!!!!!!!!!! Next on my list: Carrot cupcakes with White chocolate icing for next week's Christmas party at work..and yes, I will post how the cupcakes went. Forgot to mention, I had the same problem…I added more powdered sugar to my icing but still was to soft…somehow I manage. How can I add more consistency on it? I follow the recipe on both, ingredients and directions as I always do when I bake a new recipe..usually on the second or third time I change something 😉 Thanks for your help, and again..thanks for sharing!!! I will be posting a buttercrea mtutorial video soon, so hopefully that will help you all out. But make sure to never melt your butter! 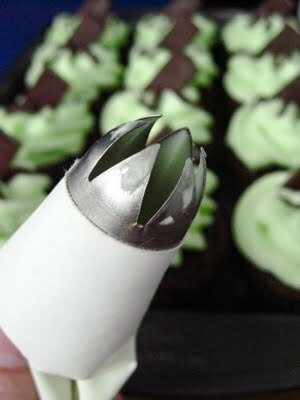 Ateco piping tips, I find them at locoal decorating places but I am sure you can get them online. Or, you can just look them up online, see what they look like and I am sure Wilton has a sismalr tip. I'm curious.. most of your recipes include boxed cake mixes. Is there a reason you don't seem to make many from scratch or is it just that it's easier? Have u made this as regular cake? I have not, I don't get many chances to make actual cakes. But the batter would work well for a cake if that is what you're worried about. If you wanted your buttercream consistency more stiff, yes add more powdered sugar. 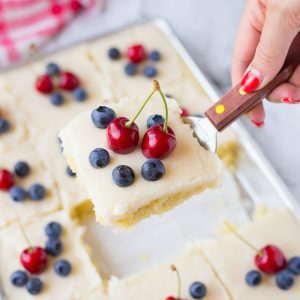 People who simply spread their buttercream on with a knife don't need frosting as stiff as people piping, so it's difficult to give exact measurements. Good luck! Thank you for replying back but for future reference .. What should I do differently to get the filling to stay liquid long enough to pipe ? You can add more heavy cream, or you can cut small holes out of the tops of the cupcakes and spoon in the filling. But yes, it does harden quickly and clogs a small piping tip. Good luck! Mmm. These looks delicious. 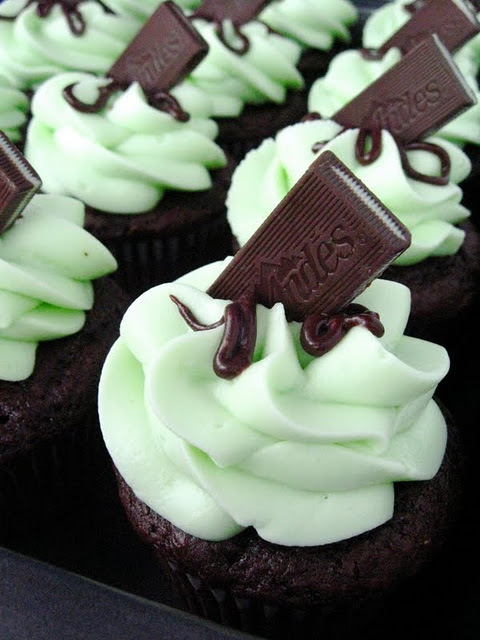 I love Andes mints, I bet they're so good on cupcakes! I followed a trail to your blog from this week’s Sweet Sixteen Collection. Congratulations! I’m glad I found you. These cupcakes look amazing! No wonder they were included in the collection for St. Patrick’s Day! These look delicious! Thanks for the idea…and the Sugar Rush! Um these look incredible! My friend Sara refered me to your blog. Where do you find your inspirations?? And your pictures are fabulous! I made these twice already. I made them for a party and then again for Valentines Day, except I made the frosting pink. I gave to my teachers as a thank you, but I dropped them in a container and then flipped and they still were yummy!!!!!!! 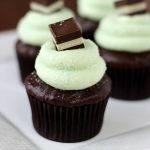 Thank you for the idea, I have always loved Andes mint candies!!!!!! These are crazy good!!! I made them using homemade devils food cake and made more of the filling. I made these into cupcakes in a jar by cutting the cupcakes in half, putting the bottom half in an 8 oz. Mason jar, drizzle some filing on it followed by some chopped Andes mints, put the top half in, pipe the frosting on and garnish with an Andes mint. Yummy!!!! I made these and they were wonderful! I blogged about them and linked back to you- thanks for the great idea! How many drops of what colors did you use to make that kind of green? Made these for a recent party and they were a HUGE hit. Turned out completely perfectly. Attempting to turn these into a cake for my sister’s birthday/father’s day tomorrow- hopefully it’ll turn out just as well! This recipe is AMAZING. The cupcakes are so moist and with the filling, sooo good. I made these cupcakes once for people at work and in two weeks I’ve gotten so many orders for them. Thank you for this amazing recipe!!! 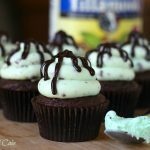 When filling the cupcake with the ganache, how do you keep the bottle tip or the piping tip from filling with the cupcake matter prior to squeezing in the filling? I did some filled cupcakes this weekend and my tip just kept getting plugged with the cake that I ended up having to make holes with a toothpick and I was disappointed with those results. Thanks! I just made these and they were AMAZING!!!! 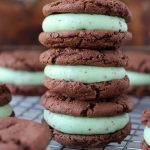 I’m not a complete mint lover so I added a half of teaspoon of peppermint vanilla and they turned out perfect! I made these for a friend’s birthday party and they were a huge hit! I’m making them again for another party but added a 1/2 teaspoon of peppermint extract to the batter, too. OMGoodness! My 11y/o daughter and I (with a little help from my 7y/o son) just made these…Holy Mint Batman! She is bringing them into school tomorrow to celebrate her birthday….Hope they are a big hit with her friends and teachers. Thank you sooooo much….FYI, my daughter was eating mint choco chip ice cream since she was 9 months old….. I just made these this weekend for a holiday church dinner and they were amazing! Wonerfull, my daughter loved this recipe so much, I will be making them for her Birthday on the 10th. Wish me luck! I can’t wait to make these!! How did you get the green color? How many drops of what color, just regular green? Regular green, just add a drop at a time until you get the soft mint green coloring. I was hoping you would show me how to melt the candy to look like yours! They look beautiful! I worked at Harmons as a Cake Decorator. Making the gourmet cakes was my favorite thing to do. 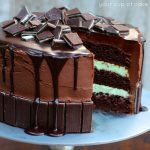 I always enjoyed making the mint chocolate because of the smell. Melting the chocolate to drizzle it around the top and decorate with the Andes mints YUUUMM! Good days…. Sorry, this was for the giveaway post!! So cute ..thanks so much!! Do you think the milk chocolate flavor of cake mix would work instead of the devil’s food one? and what did you dust the tops with, is this sugar? or salt? I can’t wait to make these! They look heavenly! I am going to be making these the night before a dinner party. Should these be refrigerated overnight? Nah! I would wait to frost until closer to the event though! I want to make cupcakes like this for my daughter’s graduation. If I make the cupcakes and put the ganache on top, can I freeze them? How much ahead of time can I do this, and what would you do as the process of freezing and unthawing? I am thinking I would then do the final frosting the day of the event? I like freezing only the cakes and then frosting the day of! They take about 12 hours to totally thaw! Usually less but taking them out a little early doesn’t hurt, it’s better than cold cupcakes! Would this cupcakes work if they were mini instead of regular size? Yes! Just adjust the baking time! My son will love these he has loves andes and york patties since he was about 1 1/2 old which is unique to say the least. Plus I love fun projects like this it’s so outside the box !! 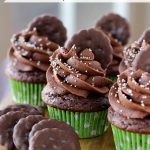 Just pinned the Andes Cupcakes. I’m going to make those soon! They look incredible! Do you fill the cupcakes when they aren’t warm or do you let them cool first? 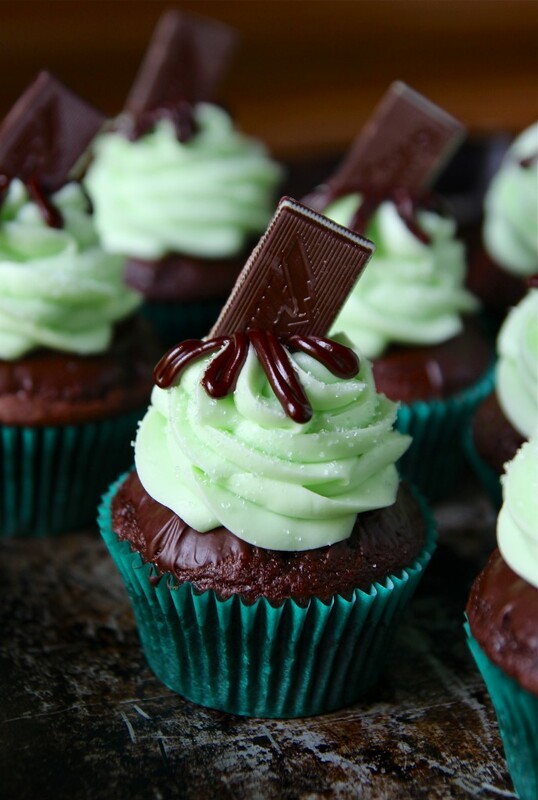 Do you use anything specific to fill the cupcakes with the chocolate filling? I was thinking just scooping a small amount of the cake and filling it before I frost it. Let me know. Marie, I have to totally agree with you on your comment!!! I’m the same way when it comes to Mint Andes. I buy them by the bag, and they do not last at my house, especially because my daughter lovesssssss them too! Esse cupcake parece um sorvete, parece muito bom também, excelente receita, estão de parabéns. The chocolate filling makes it look more delicious. People say the best way to reach the heart of a man is through his stomach. I think this recipe can really make him love you more. Still people don’t know how to talk or communicate. Because the recipe is not enough you first have to invite him to dinner or at least for a cup of tea to have this cake. To start your relationship you need really good communication skills or simply you can use some questions to him like available on this site. Try to develop some before approaching him. These are amazing and are now a regular Christmas dessert for our family!! I’ve made these several times and they are always a hit! I do add a little extra peppermint extract in the icing, but that is just my preference. 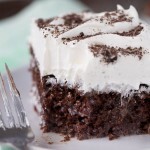 Cake is moist and the flavors go very well together!